This is a great way of cooking a beef brisket. I found the recipe in Nigella Lawson’s wonderful book called “Kitchen”. 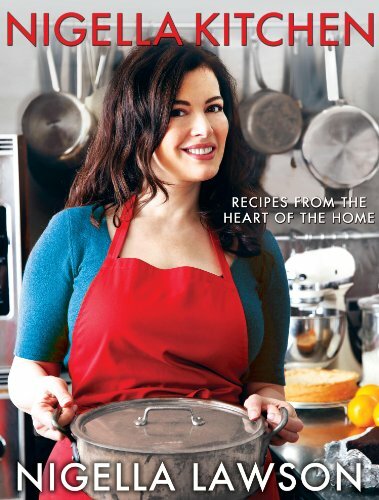 I love Nigella Lawson, her books and TV series are a great inspiration to me. I have been a fan since reading her first book “How to Eat”. I have all her books and apart from the enjoyment of actually reading them, I have enjoyed making and eating from her recipes. I’m not sure how well know Nigella is in the US, but I did see her as a judge in the Food Channel programme called Iron Chef. You may be interested to know that her father Nigel Lawson was the Chancellor of the Exchequer in the days when Margaret Thatcher was the UK’s Prime Minister. I was really excited to receive her book “Kitchen” as a Christmas present. 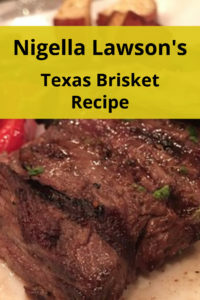 Reading through the book I came across a recipe called Texas Brisket and fancied giving this a try. I have really tried to follow the recipe to the letter however it is so rare to be able to follow a recipe exactly and this proved the case here. First of all my butcher was only able to provide a 2.2kg lump of brisket instead of the 2.5kg piece of beef brisket Nigella used, I, however, doubt this would make any difference. I however really failed to find any liquid smoke in my local supermarkets, so I substituted HP BBQ sauce woodsmoke flavor. Nigella recommended doubling the amount of Worcestershire sauce if you couldn’t find liquid smoke, but as I’m not a great fan of Worcestershire sauce I decided not to go with that option. I’m going to order liquid smoke from the internet so I have this in stock for another occasion. Roasting pan large enough to hold the slab of brisket. Slice the onions into thick slices about 1/2″/1cm thick. Place these on the bottom of a roasting dish to form a platform for the beef. Place the brisket on top of the layer of onions fat side up. The lines on the fat in the picture below are caused by the string as I bought the piece of brisket rolled by the butcher. Mix together the other ingredients, in a jug and pour this mixture over the brisket. Cover the roasting dish with foil and cook for 31/2 hours at 150 centigrade. The finished brisket out of the oven. This picture is from her book. Place the brisket on a chopping board. Make the gravy by putting the onions in a blender with a little of the cooking liquid. Whiz in the blender until the mixture is smooth, mix back in with the cooking liquid. Carve the brisket by cutting across the grain in thick slices. This is important as carving with the grain results in long fibres which are not so palatable to eat. Place the carved brisket back in with the gravy, and serve. I ate this with roasted vegetables, sweet potato, onions, red peppers, courgettes/zucchini and aubergine/eggplant, steamed broccoli and cabbage. The final dish was a great success, I really love the flavor and texture of brisket. The brisket I bought cost £15 from my local butcher, so as the dish will make around 12 portions reasonably economical. I also now have plenty of brisket left over. To reheat I place in a covered bowl and microwave until piping hot. Some of this I will freeze in individual sized portions. 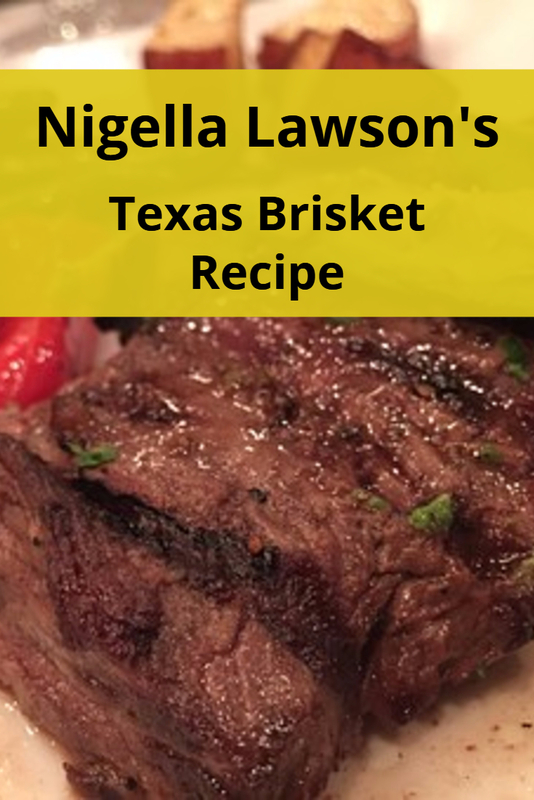 If you want to try out a great brisket recipe then I would definitely recommend this recipe.